When Erika Newman, M.D. (Residency 2008), assistant professor of pediatrics and communicable diseases, was completing her pediatric surgery fellowship at the University of Chicago Comer Children’s Hospital, she met a young patient who would help inspire her path in medicine. This previously healthy 11-year-old boy had been diagnosed with neuroblastoma after an emergency room X-ray revealed a mass in his chest. The boy, like Newman herself, had been raised by a single mom on the South Side of Chicago. After several rounds of chemotherapy failed, Newman was asked to remove the mass surgically. The operation had many potential complications — so many that the boy’s mom fainted when Newman described them to her — but it was by every definition a success. “Telling that mother that we got the entire tumor out, and that her son was free of cancer — to me, nothing in my life had been more fulfilling,” Newman says. 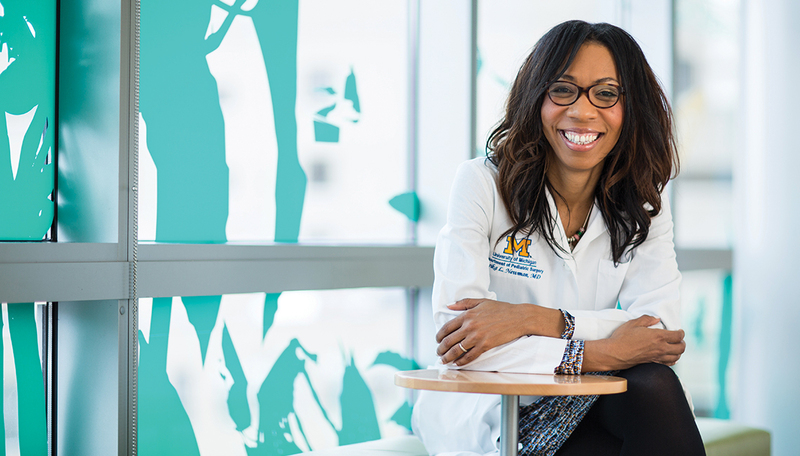 Today, Newman, who joined the U-M faculty in 2010, focuses her career, both clinically and in the basic science lab, on finding better treatments for children with high-risk neuroblastoma. Her lab recently discovered that neuroblastoma cells have a special way of repairing DNA once a DNA strand has been broken. Newman’s lab is working to develop these DNA repair pathway inhibitors — no such inhibitors are commercially available for patients currently — and she hopes to soon move the research into preclinical testing and eventually into stage 1 clinical trials. The work has been rewarding both professionally and personally for Newman, whose mother had always believed her daughter would one day help people with cancer.